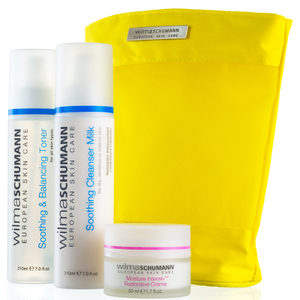 Wilma Schumann's Oily/Acne Skin Basic Regimen offers a daily skincare routine for targeted cleansing, toning and moisturizing. Specially curated for oily to acne-prone skin, the set will leave your complexion feeling comfortable and refreshed. Complete with an orange washbag. Suitable for oily/acne prone skin. A luxurious cleansing gel developed for acne-prone or oily skin types. Fortified with extracts of Witch Hazel, Green Tea and Cucumber, the revitalising gel delivers a deep pore cleansing action to effortlessly dissolve dirt and impurities, without over-drying or uncomfortable tightness. Expect a clear, radiant complexion with improved texture and a subtle, natural fragrance. Ideal for acne prone skin, the exfoliating pads work to remove excess oil, dead skin cells and makeup wedged deep into pores to leave skin clear and smooth. Specially formulated with an antibacterial solution of Salicylic and Glycolic Acids, they’re gentle enough for daily use and super convenient for a clean and clear complexion. Increase radiance and vitality. The oil-free serum is designed to inject hydration into the skin, while helping to create an overall more youthful appearance. Ideal for oily or acne prone skin that benefits from oil-free hydration and blemish control. Crafted with pure Oxygen, the formula helps to reduce the appearance of wrinkles and fine lines by visibly firming the skin. A blend of Phospholipids, Sphingolipids and Oxycarrier K bring moisturizing and anti-bacterial benefits to the treatment, leaving skin nourished and younger looking. Dermatologist tested. Cleanser: Wet face. Apply with circular motions. Rinse well with warm water. Use morning and evening. Cleansing Pads: Cleanse your skin and then use Purifying Astringent Pads for your entire face. Leave on. Use AM and PM. Serum: Apply over cleansed skin. Use mornings and evenings or as needed. Apply over entire face, neck and décolleté. Cleanser: Aqua, Disodium Lauroamphodiacetate, Hamamelis Virginiana (Witch Hazel) Extract, Leptospermum (Tea Tree) Extract, Cucumis Sativus (Cucumber) Fruit Extract, Calendula Officinalis (Calendula) Flower Extract, Camellia Sinensis (Green Tea) Leaf Extract, Citrus Grandis (Grapefruit) Seed Extract, PEG-80 Sorbitan Laurate, Cocamidopropyl Betaine, Sodium Laureth sulfate, Hydrotriticum, Menthyl Lactate, DMDM Hydantoin & Iodopropynyl Butylcarbamate. Cleansing Pads: Salicylic Acid, Glycolic Acid, Hamamelis Virginiana (Witch Hazel) Extract, Sodium PCA, Cinnamomum Camphora (Camphor) Oil. Serum: Aqua, Propylene Glycol, Glycerin, Pentylene Glycol, Trideceth-9, Ethoxydiglycol, Lecithin (Liposomes), Olea Europaea (Ozonated Olive) Fruit Oil, Phospholipids, Sphingolipids, Tocopheryl Acetate (Vit. E), Milk Lipids, Ceramide 3, Sodium Hydroxide, Phenoxyethanol, Chlorohexidine Digluconate, Parfum, CI 42090.